The cost of the most serious workplace injuries is rising. Where should employers focus their safety resources to target the most disabling and expensive employee injuries? 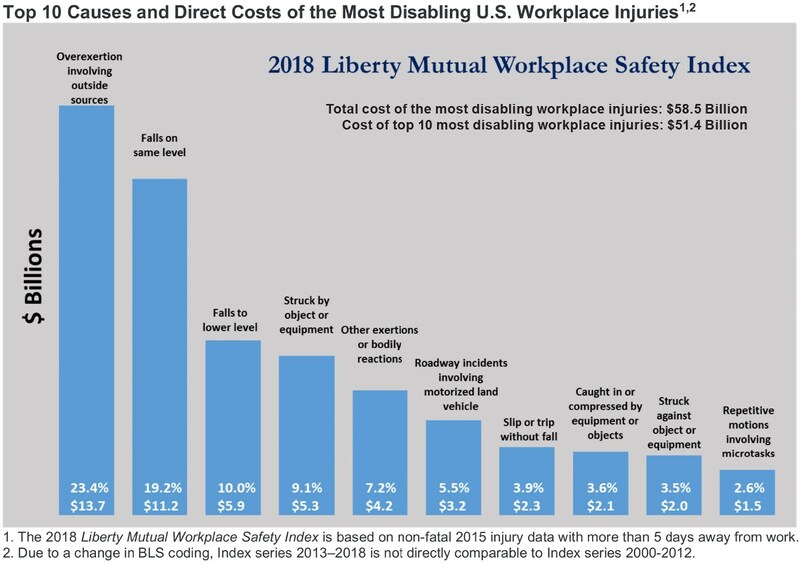 The Liberty Mutual Workplace Safety Index identifies the top 10 causes of serious, nonfatal workplace injuries by their direct costs to U.S. businesses each year. According to the 2018 Index, serious, nonfatal workplace injuries amounted to $58.5 billion in direct U.S. workers’ compensation costs. Put another way: It costs U.S. business more than $1 billion a week. Repetitive motions involving microtasks, $1.5 billion, 2.6%. Falls account for a growing proportion of the losses. 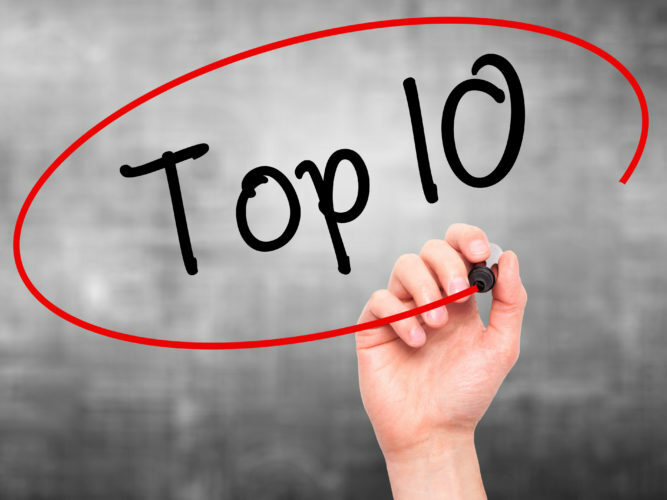 The cost of the top 10 most injuries is $51.44 billion, comprising 87.9% of the total cost burden. The top five injury causes alone account for 68.9$ of the total costs. Nos. 6 through 10 combined account for 19.1%. While the number of the most serious injuries fell by 1.5%, their cost (medical and lost-wage payments) increased by 2.9% between 2017 and 2018. “To effectively improve safety, each employer needs to understand the root causes of the most serious workplace injuries they experience, and the ways to effectively mitigate these through training, equipment and work design,” said James Merendino, general manager, Risk Control, National Insurance, Liberty Mutual. The annual Index is based on information from Liberty Mutual, the U.S. Bureau of Labor Statistics and the National Academy of Social Insurance. 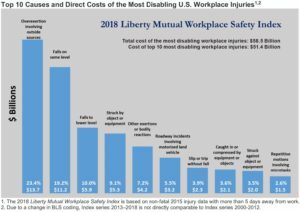 BLS injury data are analyzed to determine which events caused employees to miss six or more days of work, then those events are ranked by total workers’ compensation costs. The 2018 Index reflects 2015 data. Every article about osha or workers comp always refer to on the job injuries and or accidents. There are thousands of injured workers who are sick or battling life threatening illnesses and or diseases because of their exposure to chemicals, mold and many toxins on the job. Since most occupational diseases/illnesses take maybe years to show up many unaware workers are misdiagnosed, mistreated and not compensated. Many times employees tell the employers about their exposure many times the employers ignore and dismiss. Most doctors are not trained to recognize the connection between and disease or illness and a place of employment. Most Dr. don’t even know where the employee work or what is the work environment . Lawyers for WC is concern only about the cause, something that they know is next to impossible for untrained dr. to know so most workers comp cases for occupational diseases and or illnesses are denied and the employers has to file social security disability when the employers should be held responsible and be made to compensate the sick workers not the government, the employers are saving millions by shifting the disabled to the government. I can’t believe someone at OSHA, Depart ment of Labor or Workers Comp Bureau don’t see this. Is EVERY BODY LOOKING the OTHER WAY.